Not to be confused with Druid's Heath, Walsall. 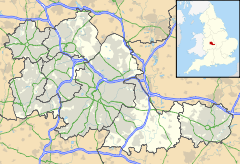 Druids Heath is an area of southern Birmingham, United Kingdom covering the south-west quadrant of the B14 postcode (west of the Maypole). Primarily known for the large council estate in the Brandwood ward of south Birmingham. The estate is situated on former farmland on the southern edge of Bells Lane with Druids Lane forming the eastern, southern and western border. When first planned, it was known as Bells Lane Phases 1 and 2 and was part of wider postwar plans for the development of the area to accommodate the growing population of the city. Nearby settlements include Kings Heath and Kings Norton; it used to be part of them. The name Druids Heath was formerly Drews Heath named after a local family who farmed here until the mid-19th century. Drew's Farm stood at the junction of Druids Lane and Bells Lane near the Maypole. .
Druids Heath is in the local council ward of Brandwood, which is represented by Labour Councillors Mike Leddy, Barry Henley, and Eva Phillips. It is also in the parliamentary constituency of Selly Oak. Therefore, it is represented in the House of Commons by the Labour Member of Parliament (MP) Steve McCabe. The schools within the Druids Heath area are; The Baverstock Academy (closed 2017), Bells Farm Primary School, The Oaks Primary School and St. Jude's RC Junior and Infant School. This page was last edited on 5 December 2018, at 10:16 (UTC).